Players are advised to read "HCA Instructions" carefully before applying "Team Online Registration". Wrong information found in Team Online Registration form will be rejected straight way and no correspondence will be entertained in this regard by HCA. Confirmation note - "Thank you for your message." above "Name of Team" column; Confirms your Team Online Registration. All participants (M + F) must report to Secretary General HCA on 1st day 9 AM or in due time @ venue of respective championship. Players are instructed to first download and read "Prospectus" of championship and then apply for Team Online Registration. Team Online Registration can only be done for those championships in HCA Tournament Calendar where Download Prospectus link is available. Last date for Team Online Registration is 3 days before Tournament Start Date. List of Online Registered Players is available 1 day before Tournament Start Date. 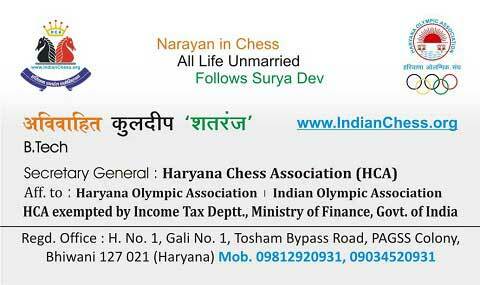 To download List of Players Plz visit "﻿LIVE Pairing & Results﻿" page. Players are not required to send hard copy of their Online Registration form to HCA. However, they can retain hard copy of their Team Online Registration form for their record. 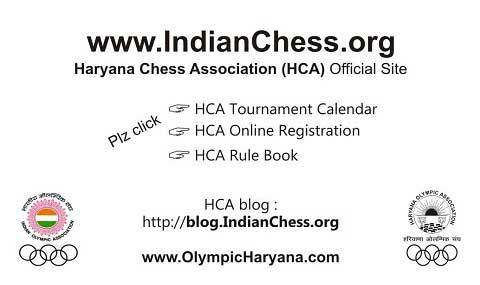 Players who does not find their name in List (Online Registered Players) can meet Secretary General HCA in person along with proof of Team Online Registration upto 5:00 P.M.. on 1 day before Tournament Start Date. There after no complaint in this regard will be entertained.